Knightdale's Annual Dogtoberfest will be held Saturday, October 20, 2018 from 11am-1pm at Ashley Wilder Dog Park located at Knightdale Station Park. 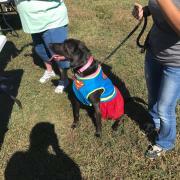 There will be a 2k9 Walk/Run for the dogs and their humans, costume contest, dog adoptions, vendors, giveaways and much more. This event is free to the public and no pre-registration is required. Please contact Susie Paschal for more information.